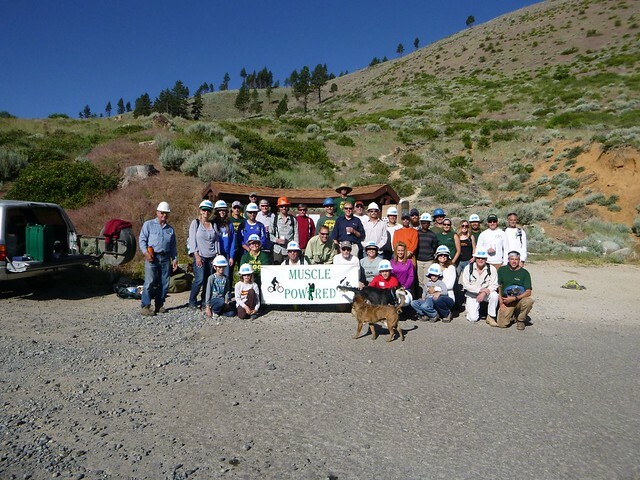 We had a fantastic turnout on National Trails Day! Muscle Powered, Graceworks, Great Basin Institute and Starbucks volunteers (Thank you for the morning coffee!) 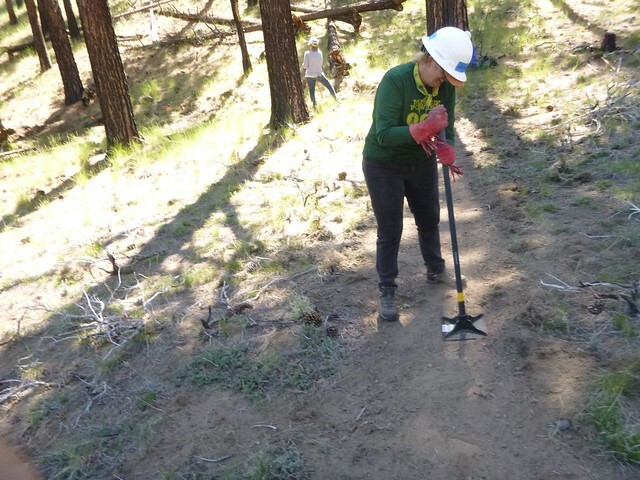 showed up at the Waterfall Trailhead early Saturday morning to work on the Ash Canyon to Kings Canyon Trail. At the sign-in table volunteers were issued hard hats and were able to grab a bit of swag provided by Clif Bar through IMBA’s Clif Bars for Trail Work Days, and Adventure Medical Kits from the American Hiking Society. After sign-in and a bit of mingling, volunteers loaded up in vans provided by Carson City and Capitol Automotive and shuttled up to the worksite. At the worksite Muscle Powered Senior Crew Leader Oliver Lieder conducted a safety talk and tool demonstration before sending crews off to work. 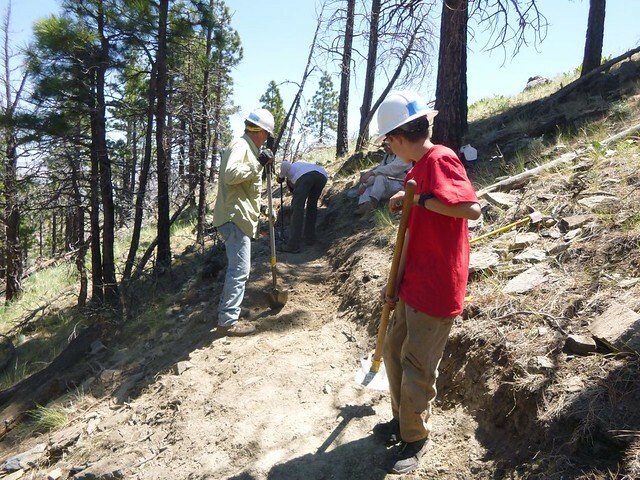 Crews lead by Ward Knous and Toby Welborn took the most difficult terrain, a steep cross slope with plenty of rock , which kept the crew busy the whole day, while crews lead by Mark Kimbrough, Oliver Lieder and Jeff Potter worked on slightly easier terrain. 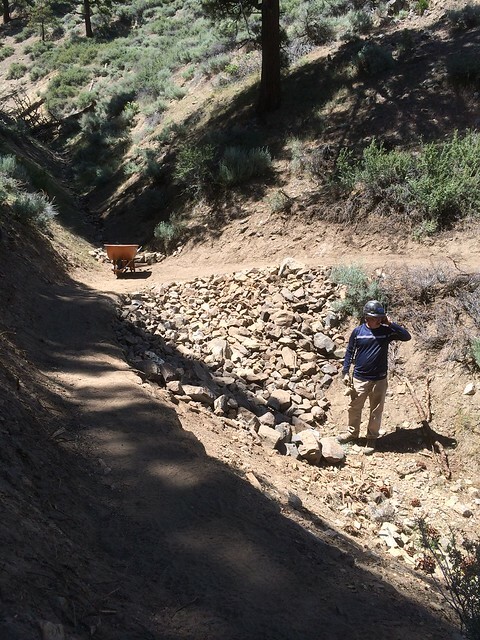 Keith Conrad lead our rock crew whose task was to pull rocks off the side slope, placed there during previous construction, and haul them to Church Bells Ravine to be used as rip rap. 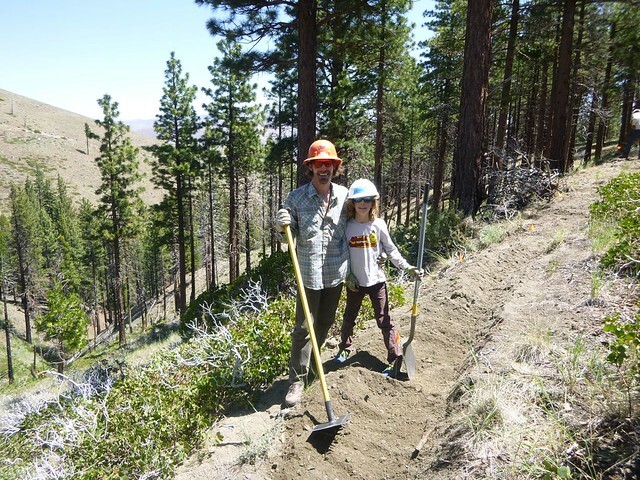 This was the first time we’ve partnered with Graceworks, and I believe this was the first time they’ve worked on trail as an organization. It was wonderful to work with a dedicated group of hard working individuals, from ages 6 to 80, all in an effort of enhancing the community we live in. Totally awesome Jenny! She brought MP and GW together. Thank you! 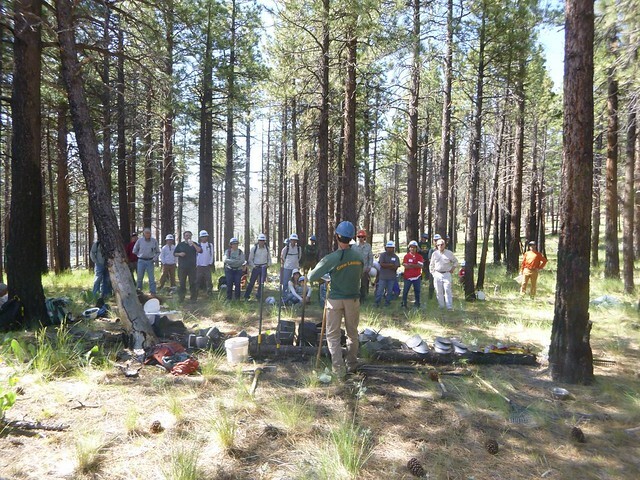 Great Basin Institute started working on Ash to Kings back in late 2012. 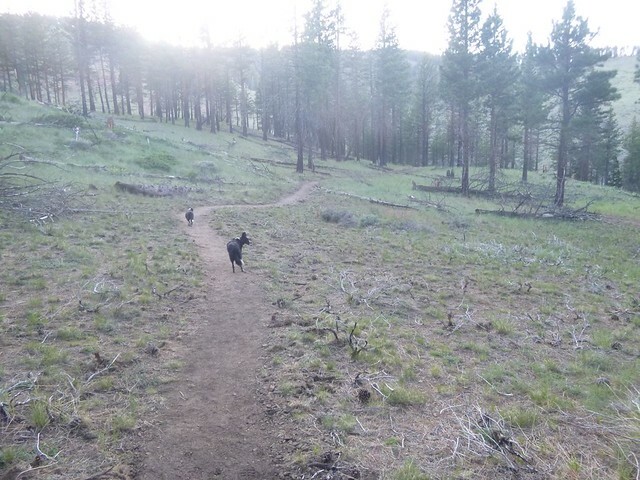 In 2013 they worked a full season and built 2 miles of trail in the middle section of the alignment. 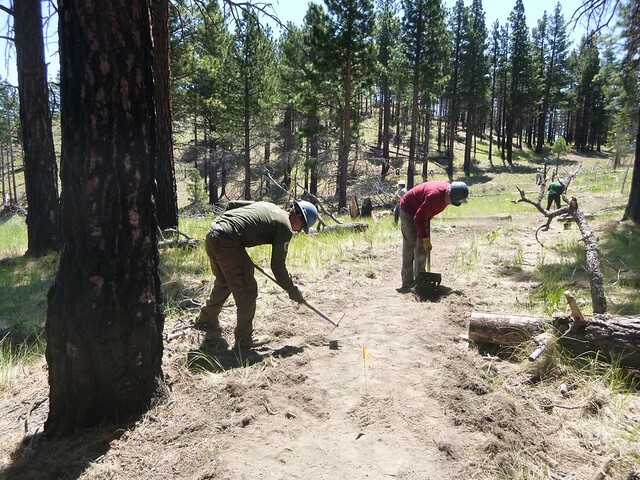 In 2014 GBI conducted crew orientation, along with a couple of hitches, and together with Muscle Powered has built 4,000ft of trail since May 1st of this year. To have GBI with us on NTD was extra special. 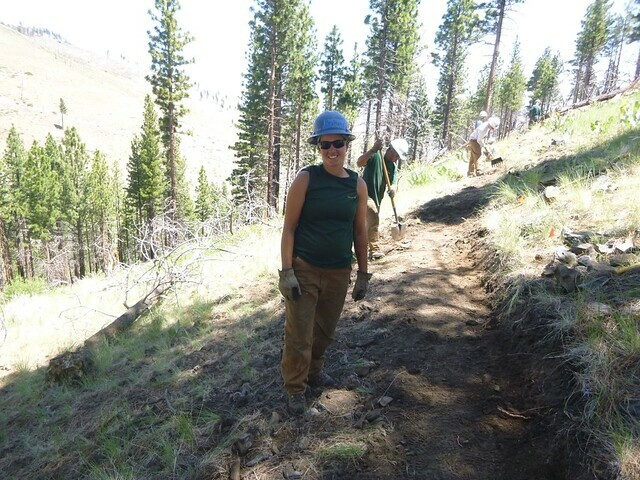 It gave everyone a chance to talk with the crews who are helping to build our trail, plus they’re a great bunch of people to hang around with. We broke for lunch at 11:45 which was made by Comma Coffee provided by a generous donation from longtime trail supporters Galena Fest and Eagle Vision. Thank you!!!!!! After lunch we worked for a couple more hours. 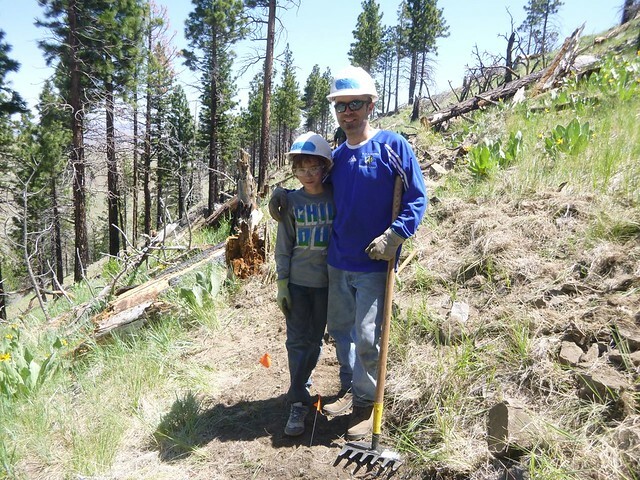 By 1:45 Mark and Oliver’s crew had finished their sections and moved up the trail to help the other crew leaders. 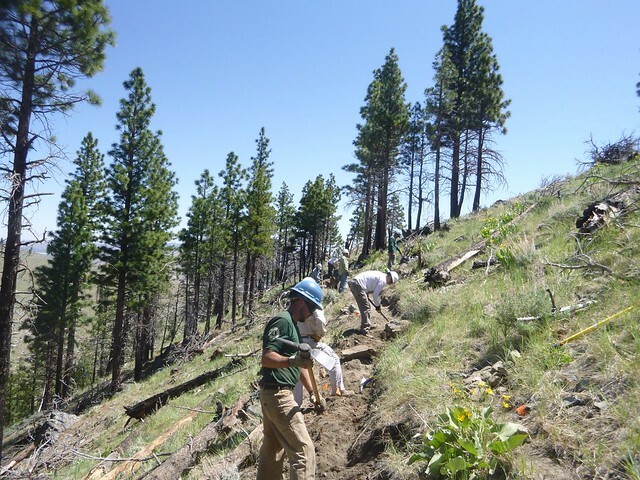 At the end of the day crews had built 1,075ft of new trail! 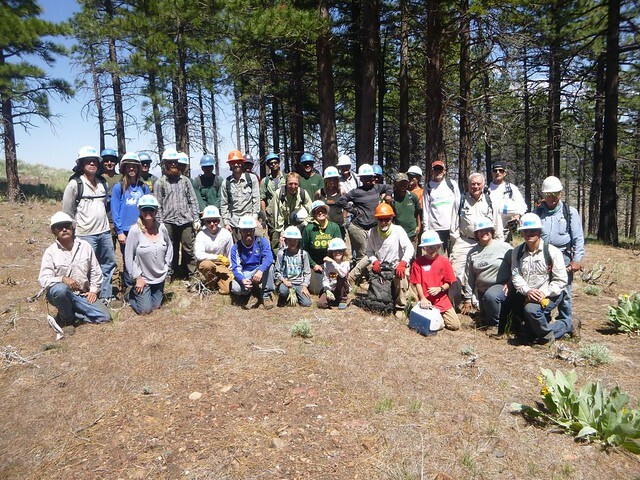 We regrouped one more time, counted tools and took one last group photo before heading home. On the way out it was impressive to see the work Keith’s crew did with the rip rap. Thank you to all who made this the best NTD ever!! !